Introducing the new and improved MultiMix 8 USB FX: Record, mix and add effects all in one place. •	Consumes 36% less power than its predecessor for reliability and energy efficiency. I had a chance to get my hands on the new MultiMix 8 USB FX at Summer NAMM in Nashville a few weeks ago. The mixer seemed to have high quality components and a general sturdiness about it that makes any engineer feel good about having it around. 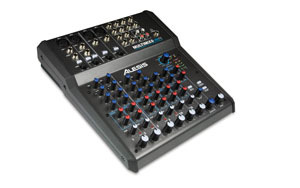 The MultiMix 8 USB FX seems to hit all of the bullet points that small formant home recordists are looking for. It improved on it’s limited input capabilites and made an all-around more useful product. Plus, it comes with Cubase LE! Rumored to release in August, I’m guestimating the price to be somewhere around the $350-$400 mark. We’re hoping to receive one in the next few months for review so check back for that.